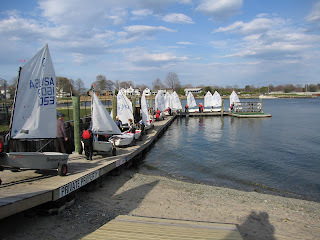 This weekend LISOT and FAST (Fort Adams Sailing Team) joined forces for two days of terrific team trials practice, hosted by Milford YC. The weekend closely resembled a National Team practice, with 5 world-class coaches, aerobic workouts, long days on the water and indepth post-practice debriefs. The weather couldn't have been better - warm temps and great breeze - especially on Saturday. We had five terrific coaches: Trevor, Isabelle Kinsolving, Annie Davidson, Fran and Spencer. 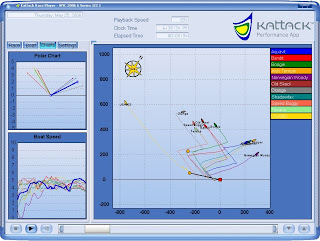 On Saturday 20 of the Opti's were equipped with individual GPS units - thanks to Spencer - which tracked their movement all day using www.kattack.com. The data were then downloaded and the tracking analyzed and plotted on screen. The kids were able to see what they did, and how they sailed. This was combined with video shot on the water, all which resulted in a 90 minute debrief that the kids really liked. 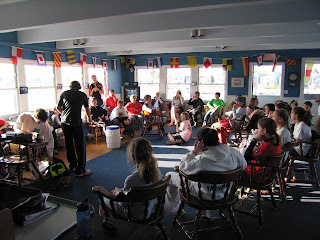 After coming off the water close to 6pm on Saturday, Milford YC hosted both teams for an enjoyable dinner. The sailors went back to the Jr. room around after dinner for a continuation of the post-race debrief and video. Sunday's breeze was a tad lighter, and the temps a tad cooler. But the joint group spent the day doing many practice starts and some racing. Everyone had a great time and the weekend provided a wonderful opportunity for the two groups to get prepared for Team Trials.